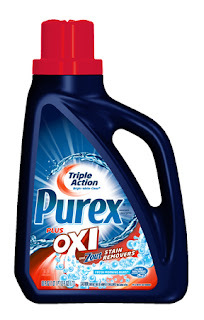 Purex has made their triple action laundry detergent even stronger with Oxi! I tried out Fresh Morning Burst fragrance, it has a nice smell, fresh and outdoorsy. According to the bottle is is hypoallergenic with a light fresh scent. I'd agree. You can also use it for everyday laundry and heavily soiled laundry-just use the amount needed for your type of cleaning. Use the cap to measure for regular and large loads. For tough stains you can put the detergent plus Oxi right on the stain and let it sit for five minutes before laundering. Closed:Giveaway: I have three coupons good for a FREE bottle of Purex to giveaway! Since it's a big hurricane going on now, the first three comments on this post get the coupons! Be sure your email is in your comment or your profile so I can contact you as long as the electricity and Internet are on! Head on over to Purex.com and enter to win cash prizes! Just fill out the quick form on Purex.com to be entered into the sweepstakes. Enter to the Sweepstakes from Whirlpool and for savings too! Disclosure: Purex provided me with a sample of Purex plus Oxi so I could review them. All of the opinions expressed here ae my own. I'd like to enter your giveaway! Thanks for the opportunity. thanks! giveaway closed, three winners above! Nicole-Lynn, Helen T, and Ashley are the winners of a FREE bottle of new Purex Oxi! congratulations!! !